How much sexism do women who play rugby in NI face? 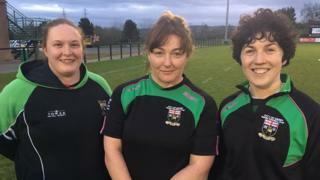 Attitudes to women in rugby have hit the headlines in recent months after a female referee suffered verbal sexist abuse during a match and sexist jokes were made at a club dinner. But what are the views of women who play the sport? BBC News NI visited to City of Derry Rugby Football Club to find out. The club attracts members from beyond Londonderry, with many players coming from areas outside the city like Coleraine and Letterkenny. According to 1st XV captain Michelle Gormley-McLaughlin, the club has worked to improve the atmosphere around the sport. "I think when we have aired our grievances, we have seen action, they [the club] have been proactive," she said. "The members in the club are more than willing to help us change things and I can see improvements, compared to some other sports I play in." The team has been steadily filling the silverware cabinet since it founded, thanks to team members achieving international glory with Ireland in the Six Nations. The club is also building for the future with its growing girls' youth team, but player Maeve O'Neill feels there's still some distance to go. "The publicity around women's sport in general is very important," said Ms O'Neill. "In the last few years, it's really improved with the women's Six Nations being on the television, which has been excellent. "But I remember as a child I was sport mad. I used to look at the paper and I would see no women in the sports section of the paper at all and I think not much has really changed there. "It would be amazing to see more press given to women's sport, because then young women would have role models and they could see themselves in that in the future." Image caption Referee Grainne Crabtree said she was subjected to a "tirade of profanities and sexual remarks"
Last year, City of Derry player and referee Grainne Crabtree experienced verbal sexist abuse from spectators during a men's match at Coleraine. "I've certainly never had anything from the sidelines," said player Joanna Ha'unga, who has played here and at numerous clubs in England. "But it's the same as every day, I don't think it's a rugby-specific problem. I don't think there's an issue more so than any other aspect of life." "There's definitely still an element of sexism there with some sports. "It is a running battle sometimes, people just don't think that you're up to the job, but you have to go out and prove yourself sort of twice as much as your male colleagues."